Consider that negotiations are synonymous with skills in marketing and sales. It’s important to make certain you’ve done everything possible to avoid regret in the end. As in marketing and sales, the best outcomes from a negotiation results from due diligence in preparation. So, obviously, to successfully negotiate any issue, you must identify your goals while understanding the motivations of the people with whom you negotiate. This means you must take the time to become fully aware of the important points to discuss, plan and to rehearse. Evaluate your skills and decide where you need to improve for a successful negotiation. Identify, assess and prioritize what’s important to you. This can be monetary and non-monetary, and short and long-term. Do what you can to build trust. Listen carefully when the other party is talking and pay close attention to their reactions. Understand the interests and motivations of the persons sitting across the table from you. It could be they’re just representing themselves. It could also be they’re teamed with others not in the room; stakeholders whom are likely to be affected by any outcome. Get to know their concerns, too. Again, before going into any negotiation, take precautions to develop a positive rapport with the other party. This entails discussing mutual interests. Diplomatically remind the other party of the value you bring to the table. Agree that there’s room for negotiation. Go as far as you can to learn and address their inclinations. There are a couple approaches you can take. You can either learn their bottom-line preferences by asking open-ended questions. Or, you can directly ask what they want. Know what commitments you’re willing to make, and what points or arguments will likely be the most effective – both for you and the other party. Use best practices in communication. That starts with intense listening and promoting your concerns and addressing those of the other party. Recognize there might be surprises. Think about all possible scenarios. So, anticipate and prepare for any possible surprises. You’ll have a better chance to enhance your position and to satiate the other party. But be prepared to walk away. If it’s an important relationship that you’ll need for the long term, consider whether you’ll risk winning a battle in the short term but losing the war long term. In other words, if you insist on something that benefits you in the short term but would alienate the other party over the long haul, walk softly. Instead, consider “log rolling” as a plan B. That means yielding if it will hurt you long term. Realistically, you can expect to win but you must anticipate that you might have to consider plan C if you don’t get what you want. That goes for the other party, too. Research and know the options. Know your fallback alternatives, if any. If you’re not successful, this means you must know two walkaway positions – theirs and yours. You might have to walk away. The 22 Dos and Don’ts for Successful Negotiations — No matter what you need to negotiate, there are easy strategies to get anything you want. But you must first remember it’s important to reach a fair compromise – with win-win negotiating skills. President Reagan showed us how to do it right. 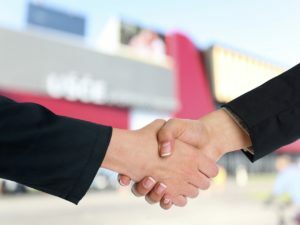 11 Tips to Negotiate Your Commercial Real Estate Lease — Depending on your locale, commercial real estate is either readily available or hard to find. Either way, it requires due diligence and skills to negotiate the best commercial real-estate lease. In Negotiations, Chit-chat Pays off More for Men than Women — FYI, some small talk just before a negotiation provides a boost for men but not women, according to academic researchers. So, if you’re a man, a little chit-chat before the serious discussion helps you make a better impression for better results. But it’s just the opposite if you’re a woman. Men benefit 6 percent more than women. Complete Guide — How to Market Your Ideas to the CEO — Whether you’re an executive — in finance, human resources or marketing seeking to be a partner in the C-suite — it’s vital to communicate effectively with senior management. To market your ideas to senior management, here are the four best practices.